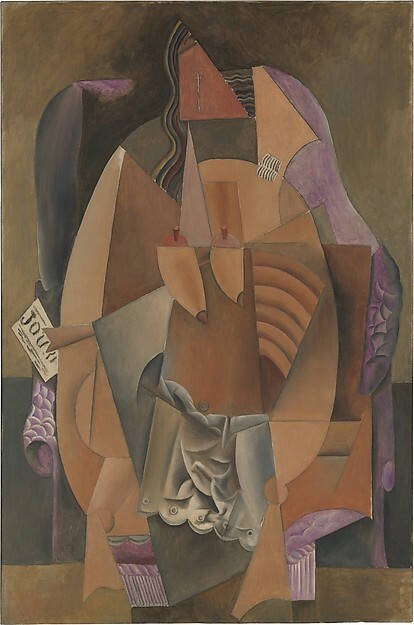 The eighty-one paintings by Georges Braque, Juan Gris, Fernand Léger and Pablo Picasso that are on view at the Metropolitan Museum of Art illustrate the birth of Cubism in Paris at the beginning of the 20th century. They are the promised gift of Leonard Lauder to his native city. By restricting his collection to four painters, Lauder was able to buy masterpieces. Though American museums owe their preeminence to the gifts of the wealthy, it is rare to meet these benefactors in flesh and blood. At the opening press conference Lauder took pleasure in explaining that when he decided to assemble a world-class collection, Cubism spoke to him. He also wanted the caliber of each work to be such that it would be difficult for a museum director to “take it off the wall.” He achieved his goal. Lauder’s collection will catapult the Met to take its place among the very few institutions that own such extensive collections of nascent cubistic art; a style that America’s foremost museum was slow to embrace. The Lauder Cubist collection rivals MoMA’s which includes Les Demoiselles D’Avignon, the school’s best-known work. Among Lauder’s thirty-one Picassos are two preparatory studies for this work. Lauder’s collection also includes many unfamiliar works. Picasso’s pastel-colored Woman in a Chemise in an Armchair, with its “naughty,” non-deconstructed breasts and other realistic overtones, surprised me and I loved Braque’s Trees at l’Estaque. Among the four painters Lauder collected, only Picasso would attain larger-than-life status. Inspired by Paul Cezanne, he and Braque created dozens of cubistic images that Henri Matisse characterized as consisting of “little cubes.” The name stuck and Picasso and Braque persevered. For many years the two painters visited each other’s studios daily and cooperated so closely that even professionals sometimes had a hard time telling their works apart. Their early works inspired Juan Gris, another Spaniard, and Fernand Léger, who developed variants. Juan Gris’s work, with its rounded edges and softer colors, is more lyrical. His intricate Still Life with Checked Tablecloth is a bravura achievement. Léger has always gone his own way. The Lauder collection includes his appealing Composition (The Typographer). The very large canvas depicts a worker deconstructed into overlapping cones, cylindrical tubes, triangles, and semicircles. Its muted primary colors gladden the heart. In his opening remarks Ronald Lauder stressed that he and his brother Ronald grew up in New York while the family’s cosmetic business was in its infancy. In his low-key manner he explained how New York City, with its then excellent public schools, museums and other readily available cultural offering, stimulated his and his younger brother Ronald’s devotion to art. (Ronald founded the Neue Galerie that showcases German and Austrian art.) Now in their eighties the “boys” are able to magnificently show their gratitude. Cubism, on view until February 16, 2015, is both overpowering and difficult to comprehend, but it taught me a lot about the form that shaped much of the art of the twentieth century. This entry was posted in Art review and tagged art, art museums, cubism, fernand leger, georges braque, juan gris, leonard lauder, metropolitan museum of art, modern art, new york, new york city, pablo picasso, picasso. Bookmark the permalink.